The software industry appears to have reached a plateau. While improvements have been made in the last 20 years, progress has been limited in scope and degree. Researchers, tool and method developers, and process specialists are all doing creative and promising work. However, as we continue making impressive technical and process advances, and even though occasional projects produce extraordinary results, broad and effective use of even generally-available best processes and methods has been slow and limited. Where new processes and methods have been properly introduced, the results have generally been positive. This would be considered success by many definitions but most software work continues to be done with ill-defined processes, poor tools and methods, and ineffective management systems. Modern software work involves many topics and there are many different specialties. Because our field is now so broad and so many different topics are now important, we have developed a wide variety of disciplines which each has its own experts. Unfortunately, these experts all have different views and, because we don’t agree among ourselves on what is important, our story is incoherent. 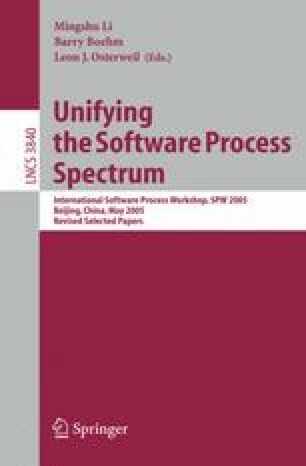 To improve our industry so that it can meet the growing demands of society, we, the software process research community, must develop a coherent, consistent, and forceful position.